All American Retro Bowling & Rockabilly Style shirt. Plain color shirt with contrasting stripe with Breast pocket trimmed to match. These shirts are practical and durable, made from Poly-Cotton blended fabric for comfort and easy-care. 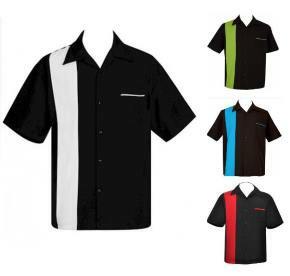 Square cut in true retro design, side vents for comfort, practical breast pocket too, short sleeve and available in a wide variety of colors and you can "mix n match" to make any combination you want! Just start out by selecting your base shirt color, then choose your contrast color, add pockets or long sleeves, and finally the size you need. We can make ANY size you need, no limits.